Warren Granville 85 Alamance Burlington Orange Chowan Franklin Bertie Nash Greensboro Chapel Hill 40 421 Durham 17 Rocky Mount 64 Wake 64 RALEIGH Cary Chatham 64 95 Durham 70 Edgecombe 64 Johnston 70 Wilson Lee 40 Beaufort 421 Goldsboro 17 70 Harnett Moore Beaufort Kinston Pinehurst 95 New Bern Ocracoke Pamlico Jones Sampson Richmond Hatteras Craven Lenoir Fayetteville 220 Hyde Greene Wayne 73 Dare Pitt Greenville Sanford Tyrrell Martin Randolph ntgomery Washington Wilson Asheboro 74 Camden Currituck Pasquotank Perquimans Elizabeth City Hertford Vance Guilford 17 Halifax Person Caswell Gates Northampton Rockingham Hoke Cumberland Craven Duplin Scotland Onslow Robeson 17 70 Carteret 70 40 95 Jacksonville Bladen Lumberton Morehead City 421 Pender 74 74 Columbus LEGEND New Hanover Wilmington ��� Capital ��� Major cities Brunswick 17 MAJOR ROADS ��� Interstate highways ��� U.S. highways ��� Blue Ridge Parkway MAJOR RAILROADS North Carolina Railroad CSX Norfolk Southern ��� Largest airports ��� Foreign trade zones ��� Major ferry routes TIERED TAX CREDITS North Carolina annually ranks the economic health of its 100 counties and assigns each to one of three tiers. 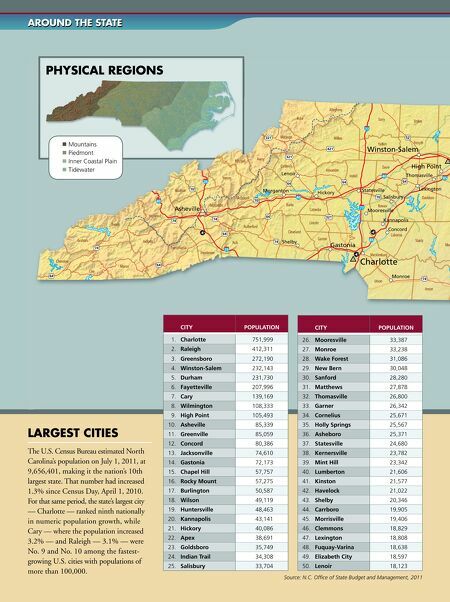 Companies that make investments or create jobs in any of the 40 Tier 1 counties, which are the poorest in the state, are eligible for credits up to $12,500 per job, 7% of investments in busi2012 DESIGNATIONS ��� Tier 1 ness property and 30% of the ��� Tier 2 expense for real property. Lesser ��� Tier 3 incentives are available in Tier 2 and Tier 3 counties. 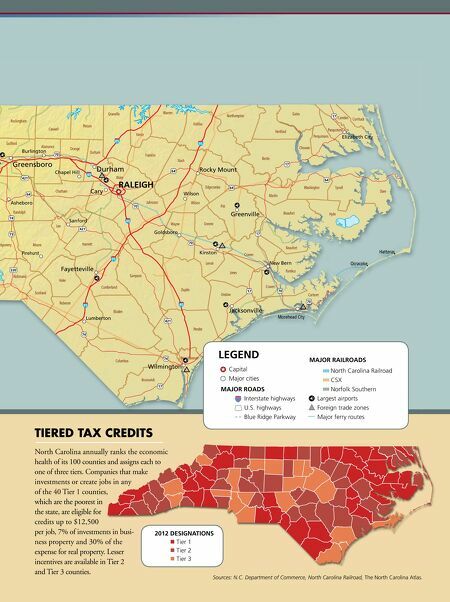 Sources: N.C. Department of Commerce, North Carolina Railroad, The North Carolina Atlas.